I have officially joined the 1912 Lending Library and I am currently working on my first piece. I am taller than most girls at 5’9″ and most definitely taller then the ladies at the turn of the last century. I had to do quite a few edits in order to make the corset cover even resemble something that would fit me. I mapped 4″ from each end and drew a straight line to spread. 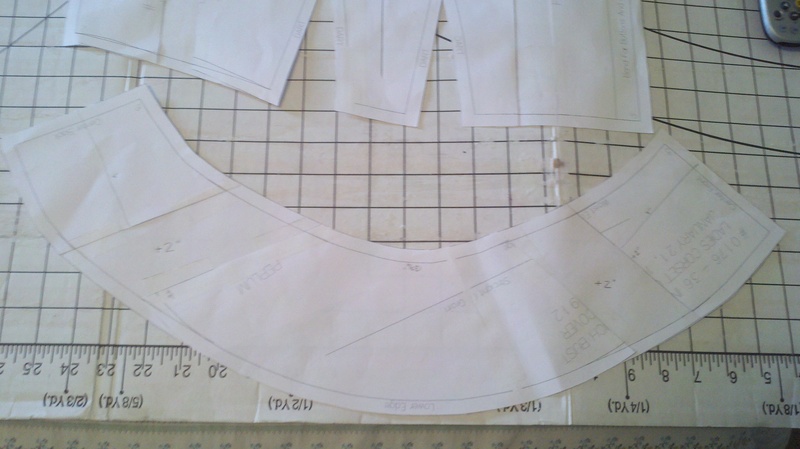 The peplum is spread 2". 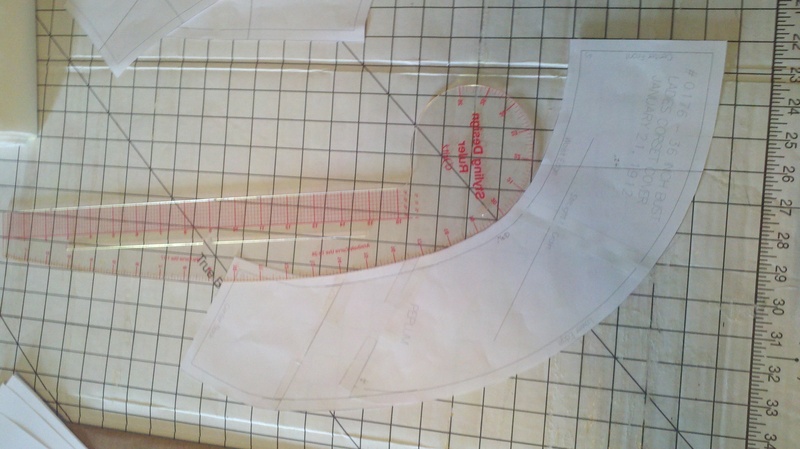 The peplum is spread 2″ on each side and then the hip curve is used to smooth the lines on each side. 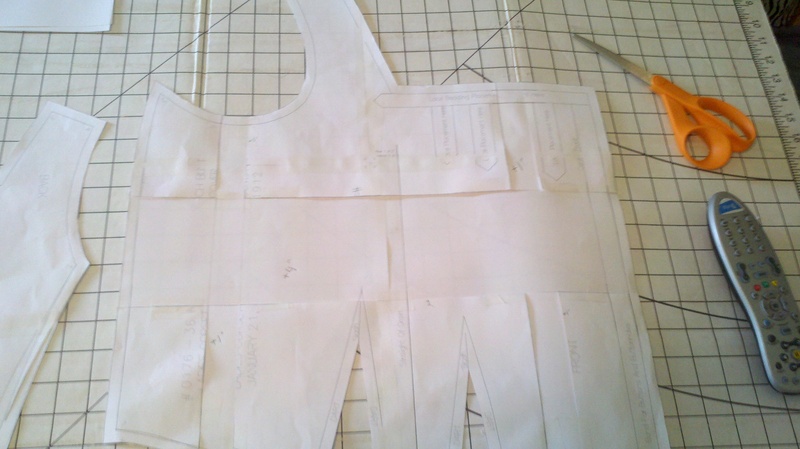 The peplum cut out and ready for mock-up. Next is the back piece, again I am tall so I needed to lengthen and to widen the back slightly. The back piece with length and width added. You can see by the inch markings on the backboard that I did the length addition 3″ from the bottom edge and 2″ from the center fold line. I added 1″ to the width and 4″ to the length. I again smoothed all of the lines using the hip curve, except the center back which I used a straight edge as it will be on the fold. Front Piece with initial additions. Now the front piece is always the difficult one because everyone is shaped differently. 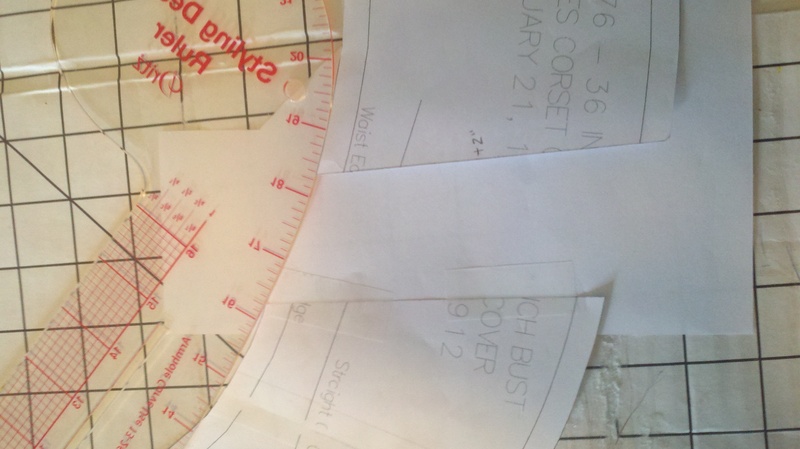 I started by adding 4″ to the length and adding1″ under the arm and to the front. 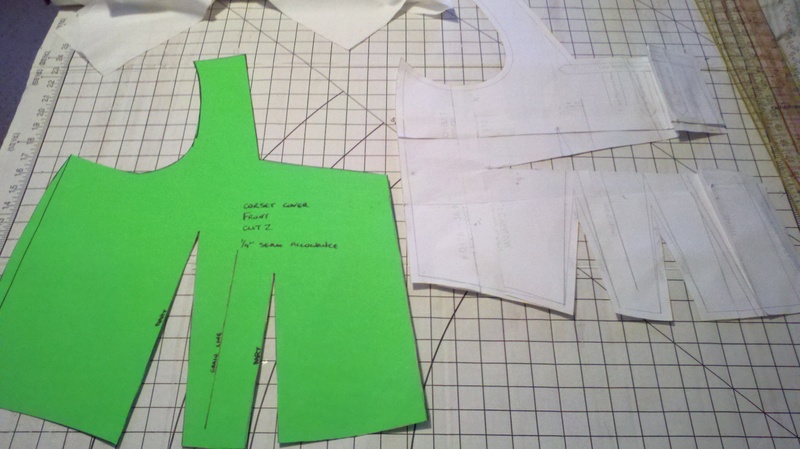 After the mock-up was made, the back and arms fit wonderfully, the front on the other hand was definitely too baggy. the paper mock up with the changes on the right, the final edition on the left including the changes. There were three main edits to the mock-up. The first, as can be clearly seen in the picture, was taking out a large section of the length addition in the front and tapering as it moved towards the back. The second edit was to take out a portion of the center front width, it was removed completely at the top and then tapered back in as it went down the length of the addition. 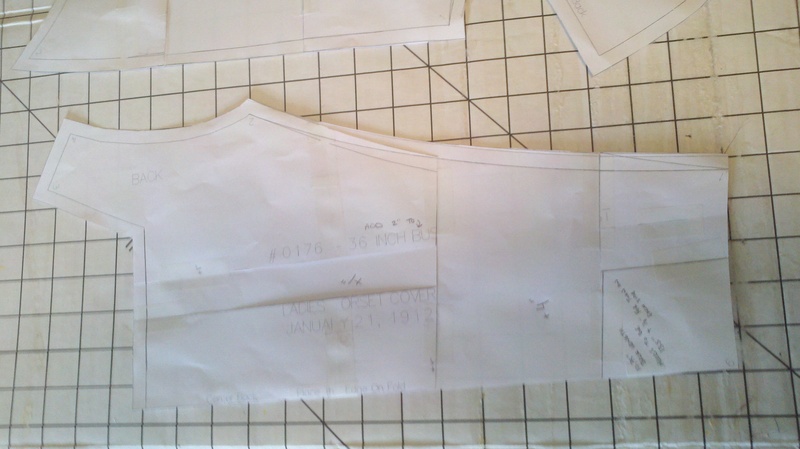 The third edit was to shape the armhole slightly at the seam where the back and front sections meet. The darts were extended up to meet where the length addition separated the points and the lines were all smoothed with a straight edge or hip curve. The mock-up with all of the changes was tried on over the Combination and the Corset with the mock-up of the top for both dresses on top, the sleeves on the Corset Cover were a little wide so I will edit that portion down for the final edition of the Corset Cover, but not for the pattern. Tomorrow I will finalize the mock-up and make the Corset Cover out of cotton gauze, finishing with several small buttons and some muslin bias tape. This entry was tagged Corset Cover, titanic, vpll1912. I can’t wait to see it! I am having to live vicariously through you right now as I had to pack away ALL of my sewing supplies (except for the quilt for the show, which I sort of have to finish). Thank you for posting all of this and feeding my addiction, lol!